Some quick thoughts on the 2014 Benziger Sonoma County Cabernet Sauvignon. 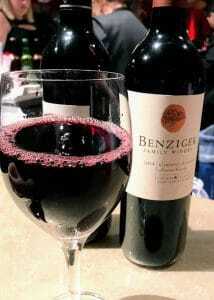 Brothers Mike and Bruno Benziger founded Benziger Family Winery in 1980 with the launch of their Glen Ellen brand. Based in the Sonoma Mountain AVA, the winery became certified biodynamic by the Demeter Association in 2000. Today it is one of the largest producers of organic, biodynamic and sustainably produced wine in the United States. In 1993, the Benzigers sold Glen Ellen to Heublein Spirits which eventually became part of Diageo. 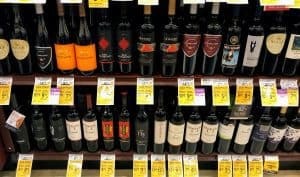 In 2015, the Benziger Family Winery itself was sold to The Wine Group where the brand is now part of a portfolio that includes Mad Dog 20/20, Cupcake, Chloe, Concannon, Mogen David, Franzia and (once again) Glen Ellen. In addition to their Sonoma Mountain estate, the winery also sources fruit from the Sonoma Valley, Sonoma Coast, Carneros and Russian River Valley AVAs of Sonoma County. Sweet vanilla, baking spice and jammy blackberry fruit sums up this wine very well. Medium plus intensity nose. Very jammy and oaky. Dark berry fruits with lots of sweet vanilla. Most of the aroma notes, especially the oak, carry through the palate with blackberry pie being the dominant flavor. Medium tannins and medium-minus acidity add to the sense of jamminess. A decent burger wine for a glass pour price around $8. Nothing complex to write home about but drinkable enough to satisfy a thirst. However, the jump to $17-20 for a full bottle is a bit much for a “burger wine”, in my opinion. Here it is competing with many other New World Cabs and red blends with a similar smooth and jammy profile that deliver much more value in the $10-13 range. Tagged Benziger, biodynamic, Cabernet Sauvignon, Chloe, Concannon, Cupcake, Demeter Association, Diageo, Franzia, Glen Ellen, Heublein Spirits, Mad Dog 20/20, Mogen David, Sonoma County, Sonoma Mountain, Sustainable Viticulture, The Wine Group.